In a recent report, Oxfam International outlined a suggested framework - Open Books for High-Risk Financing - which proposes a set of principles to systematize and enhance disclosure in financial intermediary lending. In this article, Christian Donaldson, one of the report’s authors, discusses the report and its implications for the commercial banking sector. Increasingly, development finance is being delivered via financial intermediaries. The latest data indicate that lending via financial intermediaries accounts for 55.4% of IFC’s total portfolio, 52% for the UK’s CDC Group, 45% for the European Investment Bank, and about 40% for the Dutch development bank FMO. But what are financial intermediaries? Financial intermediaries represent the nexus between development finance and commercial banking. In other words, private sector banks that receive financing from a development finance institution (DFI). DFIs use private sector banks as financial intermediaries on the premise that it will expand their development finance reach and raise the standards of the financial sector. The big question and big concern is whether DFIs can mobilize commercial finance without compromising their development mandates – with transparency and environmental and social standards as a core part of that. 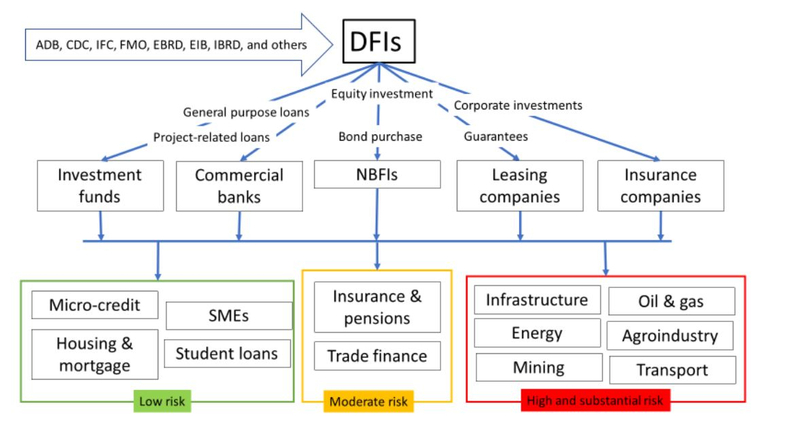 Paths for DFIs to channel funds through financial intermediaries to finance projects of varying levels of risk. However, financial intermediary lending appears to neglect principles and standards that most DFIs have in place. In addition, bank confidentiality practices represent the first major challenge when using private sector banks for development finance. Communities across the globe, from Honduras to the Philippines, have been denied the protections they were entitled to under DFI safeguard policies, since they did not know who was financing the projects that forced them off their land and livelihoods. DFIs claim that by investing in private sector banks they raise the standards of their clients, yet in the face of a series of new cases, DFIs have insisted that showing what their commercial bank clients finance or who they finance is not legally or commercially possible – pointing to confidentiality laws that, they say, prevent commercial banks from disclosing clients and projects they fund. In Oxfam’s latest report, Open Books, we want to challenge the arguments that disclosure is simply not possible within the current commercial context for financial lending. We focused on forms of disclosure that allow communities impacted by high-risk projects to see whose money is being invested and therefore what protections and rights they are entitled to, especially if the commercial bank financing a controversial project also gets financing from a DFI. In our report we outline a range of examples of disclosure practices in use by DFIs and commercial banks to essentially argue that it is possible for banks and DFIs to be more transparent. Digging into reports and policies, we found a comprehensive, albeit ad hoc, set of examples of disclosure of projects already happening. Although the examples are few, they represent an important precedent that includes: HSBC’s new agricultural commodities policy - set to recruit clients in the palm oil sector based on their willingness to be transparent; the disclosure of project names, subject to client consent, by banks that have adopted Equator Principles (including many DFI clients); and subscription-paywall financial industry databases like Thomson Reuters that disclose financial relationship details for marketing purposes. Our report shows that while there are still legitimate questions and challenges about how to disclose project information, disclosure is a choice and not a legal roadblock. Our report shows that many banks are already asking and are willing to ask their corporate clients to disclose information about their business relationships, though this is often for marketing purposes rather than accountability. But in doing so, however, the arguments of client confidentiality and perceived competitive disadvantage are at the very least questionable. In the report we recommend a proposed framework for DFIs and banks to commit to a time-bound transparency and disclosure reform agenda of disaggregated project-level information regardless of the financial instrument, be that project finance, corporate finance, equity, general purpose loans or bonds. We encourage DFIs and their commercial bank clients to set up and convene a multi-stakeholder dialogue with CSOs and bank regulators to discuss practices, tools, and approaches to transparency and disclosure and how to apply them in different legal contexts. Private sector banks should develop a comprehensive disclosure policy and set up the appropriate mechanisms for project information disclosure of higher-risk activities they engage on regardless of the financial instrument used. This disclosure policy and system should be a core component of their Environmental and Social Management System. Furthermore, we recommend DFIs and banks to create incentives that allow for better screening of clients that are willing to step up and promote a global norm of higher-risk project-related information disclosure. At this moment, there is an important opportunity for private sector banks to take the leadership and improve their transparency practices. It is critical that the current review of the Equator Principles put in place mandatory requirements for their members to bring transparency to their lending. An important step forward would be for the new Equator Principles to require adopting banks to develop a comprehensive transparency and disclosure policy as the most critical component of an environmental and social risk management system that allows for high risk project related information to be mandatorily disclosed. In early October this year, the IFC has also announced that it will pilot an initiative with its commercial bank clients to disclose high risk projects’ name, sector and host countries. This is certainly good progress and moves the needle forward, and we strongly encourage other DFIs to follow suit.